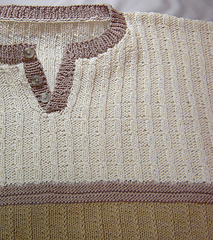 K1, p1 rib starts off the lower edges, giving way to a slip stitch rib, followed by a well-placed raised border that introduces the mock cable stitch and continues to the finish line at the shoulders. 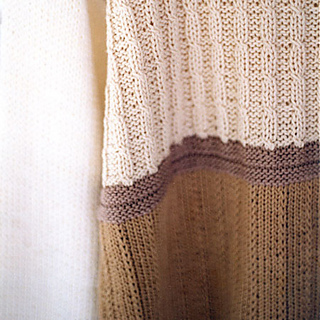 The sleeves knit in plain stocking (stockinette) stitch create a nice contrast to the rib texture. The sleeves are drop and there is a three-button closing at the crew neck. 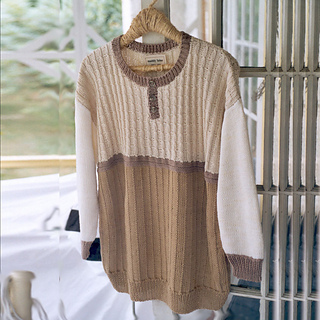 Choose a yarn that gives great definition and let the texture shine on this one. In cotton or wool, it should surely please either the lucky man you have chosen to knit for, or the clever man who has chosen to knit for himself.